In this space, the images of 12 missing children should be displayed. Since you are seeing this, you are not using a Java capable browser, and therefore cannot see these kids. If you wish to have a look or want to help, try the link below. Thank you. WHAT'S NEW? More model photos added on the Models Page. The American circus is older than the country itself. The first circus troupe of record dates back to 1724 when a small troupe gave its first performance in an open arena outside of Philadelphia. The first complete circus performance is generally ascribed to John Bill Rickets who built an amphitheater in Philadelphia and gave his first performance on April 3, 1793. President George Washington was an avid circus fan and attended Rickets' show on April 23 and 24, 1793. By the early 1820s there were approximately thirty animal circuses touring the eastern United States. These shows moved at night by wagon, over country roads, often mired in mud. During the heyday of the railroad circus, these shows would become known as "Mud Shows" for obvious reasons. There had been an occasional attempt at railroading by a few of the early shows, but most went back to the wagons and country roads after only one season. Eventually, the term, "railroad circus," became synonymous with large circuses. In the early years, people began to think that if a circus traveled by rail, it had to be modern and big. A circus who made the transition from mud show to the rails had reached the big time. The railroad impacted the type of equipment carried by the circus. Mud shows made every attempt to keep their wagons light and small in size, but the railroad circus permitted the shows to increase the dimensions and weight of their wagons. After the penny conscious circus owners filled the insides of their wagons, they modified the outsides to carry even more equipment. 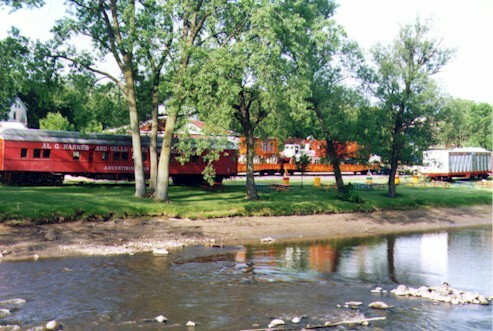 The wagons were further modified to include removal of the wagon poles used to pull the wagons to the show grounds so that they could get more wagons on a flat car. When the railroad circus owner could no longer modify the wagon to carry more equipment, they modified the rail cars themselves. The circus wasted no space on the railroad cars; extra tent poles were stored either on the roofs of stock cars or under the wagons on the flat cars. The railroads generally charged the circus to haul their train in multiples of five or ten railcars. If a show consisted of ten to 35 cars, the railroad charge in increments of 5 cars; shows of forty or more cars where charged in increments of ten cars. So, whether the circus train consisted of 16 or 20 cars, the owner was charged for a movement of twenty cars. Therefore, you will find that the length of most circus trains was in multiples of five or ten. Before the days of trucks and tractors, when horses were the prime means of moving the wagons from the train to the circus lot, the circus train consisted of approximately 50% flat cars, 25% stock cars, and 25% coaches. A typical 20 car train of the time would consist of 5 stock cars, 10 flats, and four coaches. The fifth coach would be traveling ahead of the show as an advance or advertising car, perhaps connected to a scheduled railroad passenger train, but was still included as one of the 20 cars of the circus train. You will find more about these specialized cars in the railroad equipment section of this site. Circuses maintained their own fleet of railroad cars in winter quarters during the off season. 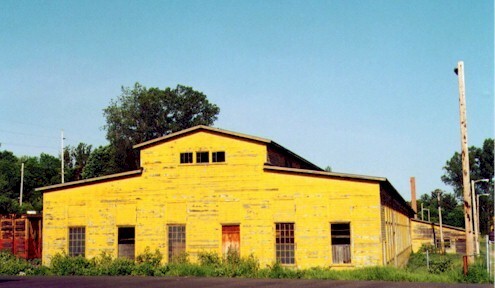 This is the car barn for Ringling Brothers Circus located on the property of the Circus World Museum in Baraboo, Wisconsin.